I’ve always been fascinated, as many people are, with the differences between generations. 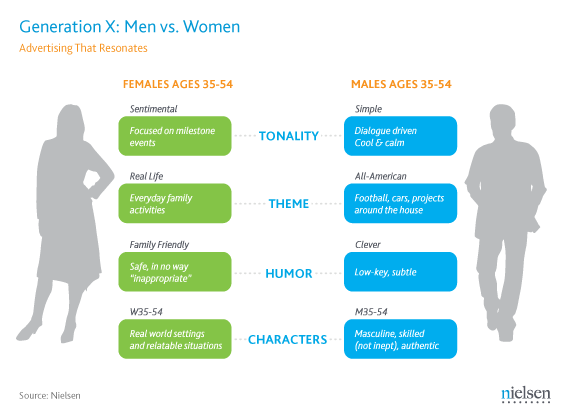 Generations behave differently, are motivated by different things, and consume media in such different ways. All of these differences are motivated by the events happening in the world as they grew up or the access they had to certain technologies. My mom is a huge fan of reality TV. For the 33rd season of her favorite show, “Survivor”, the tribes of contestants were broken up into Millennials vs. Gen X (a.k.a. My generation vs. Her generation). If you don’t know much about the show, each tribe competes in weekly competitions for luxury items (food, time with family, time away from camp, etc.) and immunity (this will prevent someone from being eliminated/voted out). I loved watching that season, and even though we are roughly 1000 miles apart, I enjoyed talking about it with her because it was fascinating; Each tribe’s campsite functioned so differently, each competition fared differently for each team depending on the type of competition, and the interactions between contestants on each tribe were so widely different. This generation is the second, largest behind millennials. The Baby Boomers were born during the years 1946-1964. While they are the older generation marketers are trying to reach, they are more tech-savvy than you would think. For example, according to 4Imprint, in 2012 those considered Baby Boomers (age 47-65 at the time) spent 27 hours online weekly — two more hours weekly than the Millennial generation. They even spend the most money on technology per year of all the generations. Ideal ways to reach this generation include Facebook Advertising (more than 70% of Baby Boomers are active on this Social Media platform) and Mobile Email campaigns. Like mentioned above, this generation is a lot more tech-savvy than they are given credit for. One great example of a recent campaign that has attempted to reach the Baby Boomers is one from T-Mobile and their Chief Executive, John Legere. The announcement of releasing “Baby Boomer” specific plans came in the form of a video on Facebook from John Legere. Those in this generation were born between 1965 and 1980. The graphic on the right shows what this generation resonates with when it comes to advertising. Generation X is the first generation to have the internet around for a majority of their life. With that being said, they are some of the earliest adopters of social media platforms like Facebook, Twitter, and MySpace. According to eMarketer, about 74.5% of the 65.8 million Gen Xers are active on these Social Media platforms on at least a monthly basis, and even more popular among them than social networking is Digital Video, with about 79% of this generation downloading or streaming video online on a monthly basis. This generation also reacts well to nostalgic advertising. One great example is the “Our Song” commercial from UnitedHealthcare. This advertisement is relatable and was delivered via digital video platforms to capture the Gen X audience. Born from 1981 to 1996, millennials, or Generation Y, have the largest purchasing power of all generations in the US, at nearly $4 trillion a year, according to Oracle. This generation grew up in a technology-driven world, and some of those in this generation do not recall an internet-free world. 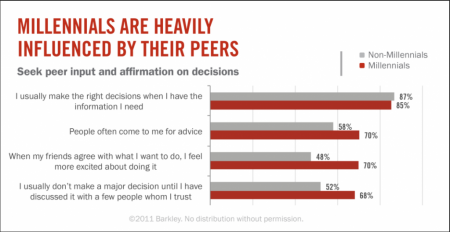 The biggest driver for millennials, as the chart on the right shows, when making decisions is peer influence. Nearly 68% of millennials reported that they will not make a major decision until they have spoken to people they trust about it first. This has caused businesses to utilize Influencer Marketing to reach this consumer, by partnering with the YouTubers, Instagrammers, etc. that this generation looks to for advice. Businesses are using platforms like Yelp, TripAdvisor, and Rotten Tomatoes, to learn more about their customers, and customers are using them to find out about businesses. Ensuring consumer reviews and experiences are top-notch is an excellent way for businesses to indirectly speak to this generation through these platforms. Our team here at Texas Creative put these findings to use in a campaign we did for Papa John’s Pizza San Antonio. To help generate awareness for a Wednesday Gameday promotion we came up with — to boost Wednesday sales — we used a local influencer, Spurs Jesus. Knowing that our target audience, millennials in San Antonio, are big fans of the Spurs and make up a large majority of Spurs Jesus’ following, we knew he would be a great fit to help get the promotion out there. You can read more about our campaign with Papa John’s San Antonio here. In conclusion, looking at the differences in how each of these three generations interact with your brand’s advertising is such an important thing to consider when planning out everything from campaign messaging to media placement. As you’ve seen, each generation consumes media in a different manner, and it is crucial to determine where your target audience is in order to ensure your brand’s campaign is most effective. Remember, there is no way to succeed if you try to reach everyone. Brands succeed by using the right medium to reach the right people. If you have any additional ways you or your brand have found to be effective in reaching these different generations, or any other generational marketing facts, please share them in the comments below! I’d love to hear them (I’m a nerd for stats…if you can’t tell).